Our USA pennant, manufactured for us by Standard Pennant Co., Big Run, Pa. I had written several blog posts (for my public relations business) about some of my favorite U.S.-made products and brands when I decided to get in on the act. It was fall 2016, and the holidays were soon upon us. I needed a couple of items that we could produce quickly. I reached out to one of those favorite U.S. brands, Oxford Pennant in Buffalo, N.Y., a designer and manufacturer of wool felt pennants, flags and banners. Oxford’s retro vibe fit well with my image for Stay Apparel Co., which I had been pondering for some time but hadn’t yet launched. Oxford founders and owners Dave Horesh and Brett Mikoll helped me develop a retro Hershey pennant, on maroon felt with cream-colored band and screen print. It was in our initial lineup when Stay debuted in October 2017. 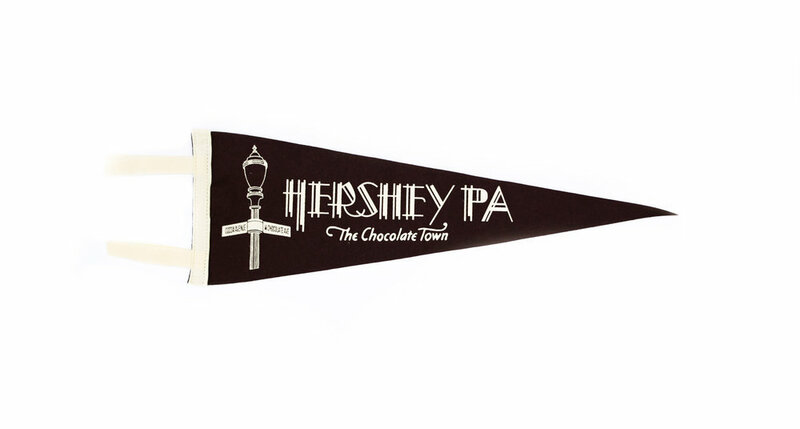 In January 2018, we introduced a USA pennant, made for us by century-old Standard Pennant Co. in Big Run, Pa.
Our first product, a Hershey wool felt pennant we developed with Oxford Pennant in Buffalo, N.Y.
Perhaps you are familiar with the hat brand ’47. The name references 1947, the year that twin Italian immigrant brothers Henry and Arthur D’Angelo started Twins Enterprises in Massachusettts. I knew of Twins because the D’Angelo family for decades has operated a souvenir stand across from Fenway Park, home of my beloved Boston Red Sox. Arthur D’Angelo can’t recall much about his start with the brand, but his son, Bobby, helps translate some of the stories he can recall his dad telling. Namely, that the brand so heavily focused on hats and T-shirts nowadays actually started with a pennant. After the Declaration of Independence pennant came the Red Sox ones. The Red Sox won the American League Pennant in 1946; the brothers thought selling sports pennants might work as well as peddling political ones. So they started ’47 (originally Twin Enterprises). They sold the pennants alongside newspapers and, eventually, baseball caps. Pennants can put you in a time and a place but are timeless. I can remember my parents buying me a blue-with-white felt pennant with “Lisbon” printed on it when we attended an open house at Lisbon Elementary School in Maine. I ordered a pennant from the old Philadelphia Firebirds hockey team when I was a kid; it was one of the rigid ones that were popular in the 1970s and, to my great chagrin, arrived folded in an envelope! I gave throwback felt pennants from Philadelphia-based Mitchell & Ness as gifts to a couple newspaper colleagues when they moved on to new jobs. Pennants can come in different sizes (ours are 7 inches by 21 inches; 9 inches by 27 inches is another popular dimension), but unlike tees they don’t face the challenge of fitting a human form. Pennants are an inexpensive way to decorate (ours sell for $20), whether pinned to a bulletin board or framed behind glass or sewn to a pillow. Most important, pennants are fun. Try looking at Oxford’s assortment without smiling or even laughing: see exhibit A and exhibit B, for instance. We envision adding more pennants in the future (if you have an idea, please send it to hello@stayapparel.com). Classic wool felt pennants will always have a home at Stay. We met Steven and Allison at our first Harrisburg Flea, on the frigid first Saturday of January 2018. While explaining Stay's commitment to U.S.-made products, I also told them about a couple of my favorite domestic brands, American Giant and Dearborn Denim. When I saw the Harrisburg couple again in March, Steven excitedly said to me, "Hey, look what I'm wearing," drawing attention to his Chicago-made Dearborn Denim jeans. It wasn't quite "Miracle on 34th Street" with the Macy's Santa sending customers to rival Gimbels, but I won't hesitate to steer Stay customers to other U.S.-made brands that I hold in high regard. I pride myself on wearing some of them to our pop-up events, from Bills Khakis button-down shirts to New Balance sneakers, from my Shinola watch to my own Dearborn Denim jeans. I've always been fond of U.S.-made products, having grown up in Maine when almost everything L.L. Bean sold was domestically produced. Unsurprising, starting Stay and sourcing our products, whether from Pennsylvania or Indiana, California or Cleveland, has reignited that passion in me. To be sure, I have a vested interest in the Made in America movement. I would love to sell the world a Stay tee. But I also believe that a movement has to be bigger than a few brands. So I try to recommend U.S.-made brands to customers who seem so inclined. When consumers know about U.S.-made options, they just might consider and even purchase them. American-made products can be more expensive than their imported counterparts, but not always and sometimes with good reason: namely, they're built to last longer. Most people just want a good product and a good value, regardless of country of origin. They're not wrong for doing that, but maybe they just haven't thought through the implications of relying too heavily on imports. Even in this information age, there's great value in making physical goods. It's good for jobs and wages, which is good for communities. It's good for civic pride to be known for a product, right Hershey? It's good for the environment to source things nearer to where they are consumed. I'll go so far as to say that it's good for national security, because societies that can make things for themselves are less vulnerable to external events. Since launching Stay in October 2017, we've been on the pop-up circuit: Harrisburg Flea, York Flea, Creatively Lancaster and, all summer 2018, Market on Chocolate. I never cease to be impressed by the talents and products on display from local makers. The vendors you find at makers markets are the antidote to the utilitarian, experience-less state of most retail in America, akin to what local and regional craft brewers have done to revitalize a homogenized, stagnant national beer industry. And even though the likes of American Giant and Dearborn Denim are far bigger than pop-up vendors, they share the same ethos. They love what they do, they engage with customers, and they make great products in America. If you want to explore some of our favorite Made in USA brands for yourself, you can look at who we follow on Instagram. Or come talk with us at a pop-up event near you, just like Steven and Allison. As part of the process of developing Stay’s brand identity, I came across a 2012 column written by Edward T. McMahon, a land-use expert with the Urban Land Institute. He discussed "[w]hat attracts people to a place and keeps them there." "Place is more than just a location on a map. A sense of place is a unique collection of qualities and characteristics – visual, cultural, social, and environmental – that provide meaning to a location. Sense of place is what makes one city or town different from another, but sense of place is also what makes our physical surroundings worth caring about."